Tokes Platform Newsletter, October 2018 — Conferences, conferences, conferences, and some serious development. Fall is upon us, and it would seem that conference season is in full swing. Being based in Las Vegas, we get more than our fair share of blockchain-centric events and gatherings, and this year seems particularly stacked with conferences. We will discuss a few of our more notable appearances — upcoming and past, along with recent business and software developments. For the unfamiliar, Nevada’s SB 398 law makes the state a particularly enticing environment to build blockchain projects. As such, efforts are being made to encourage cooperation between politicians, software developers, and visionaries around blockchain development for the state. Build the New Nevada was held on September 24, and Tokes founders Gabriel Allred and Michael Wagner shared the stage with Nevada Assemblyman Steve Yeager, Lieutenant-Governor candidate Kate Marshall, Treasurer candidate Zach Conine, County Recorder Larry Burtness, and several other influential Nevadans to discuss how blockchain can improve the state. 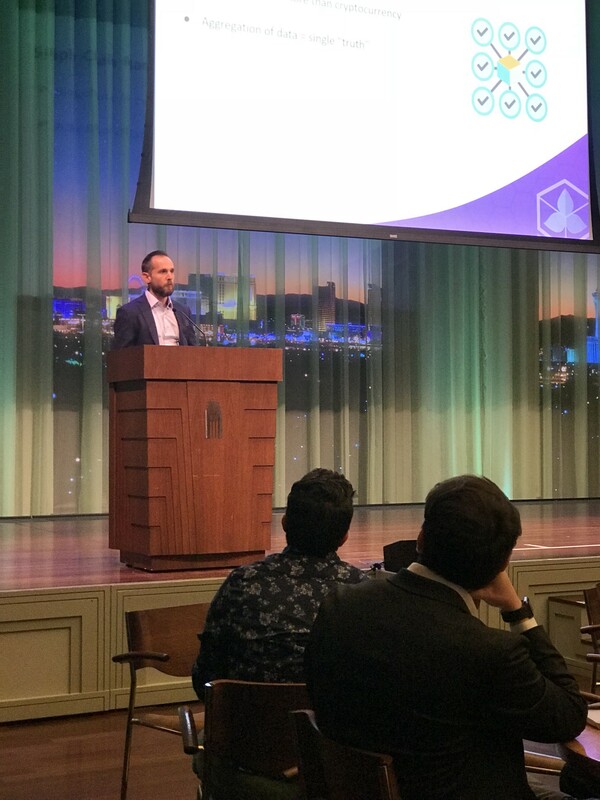 Gabriel and Michael gave two presentations, the first highlighted how blockchain can improve supply chain visibility for the regulated cannabis industry. The second demonstrated the suite of products Tokes has produced for payments within the dispensary — from acquisition of Tokes at a kiosk onto the mobile application, to the purchase of product using the Merchant Gateway point of sale, to tracking and reporting the transactions on the Tokes Explorer. The presentation and product demos were well received by those in attendance. As a team we are excited to be showcasing our software solutions to audiences interested in deployment within our home state. Speaking of the Tokes Block Explorer, we now how a live version for our users to try, available at https://explore.tokesplatform.org. To our knowledge, this is the first block explorer dedicated to a specific Waves asset. Presently, the Explorer allows you to search by wallet address, block ID, or transaction ID. In the future we will produce a private iteration of this explorer for state auditing purposes, allowing regulators to inquire about sales data for particular merchants, ensuring appropriate taxation was paid on consumer purchases. We encourage our users to test drive the explorer today. In addition to recently attending San Francisco Blockchain Week and Hoshocon, the Tokes team will be attending one of the biggest cryptocurrency conferences to hit Vegas from October 31st through November 2nd: World Crypto Con. Tokes cofounders Gabriel Allred and Michael Wagner will be on site with the Vault Logic team demoing the Tokes Mobile Wallet, Merchant Gateway, and TKS integration with the Vault Logic Kiosk. Swing by our booth and get a free Tokes t-shirt in exchange for trying out our software. With over one-hundred exhibitors on the floor and one-hundred and twenty-five keynote speakers, this will likely be one of the larger conferences of 2018. We look forward to meeting many of you there! One under-discussed portion of our new website is the “Apply to Join” page. Tokes is always looking for new, innovative projects that have a synergistic overlap with our own development and business goals. Working in the blockchain space, there are now thousands of tokens — many with single purpose use cases. While our core product focus is on consumer transactions using our Merchant Gateway, there is applicability of our software and the Tokes token for uses outside of only consumer cannabis purchases. To this end, we invite teams producing software products with novel token implementations to join our ecosystem. By integrating Tokes into your software, you will have access to our best-practice development, software testing, and deployment infrastructure. Additionally, we we can incentivize your development efforts (and users) with Tokes (TKS) distributions to accelerate growth and adoption. By integrating with us, not only is our software DevOps infrastructure and support at your disposal, but our marketing, back office, compliance, and legal resources are as well. More information can be found at: https://tokesplatform.org/apply-to-join/ — and interested teams are encouraged to fill out the Google form linked from there. We have completed a full compliance audit of our Merchant Gateway in efforts to ensure that we meet the necessary reporting and privacy requirements for a money transmitter’s license within the state of Nevada. While we understand that much of the ethos within the cryptocurrency space is about self sovereignty via decentralization, we also know that following the current legal guidelines is key to minimizing major legal hurdles down the road as we scale. As such, we always aim to stay within the legal bounds of how we conduct our business and how our software functions. We look forward to announcing further developments on this front soon!